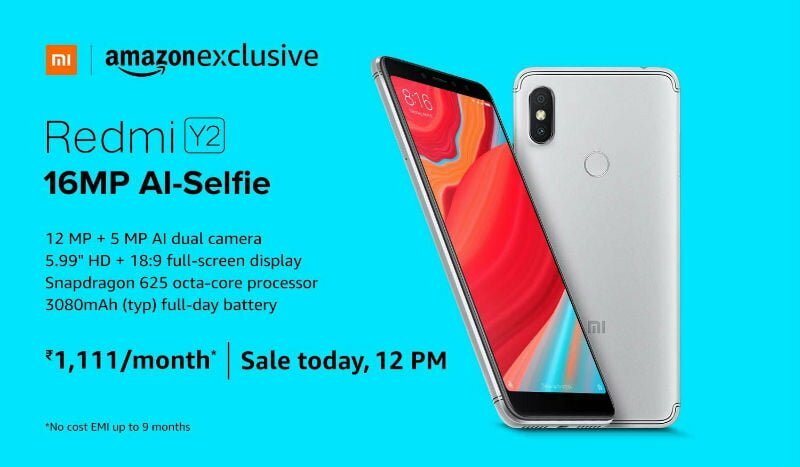 Xiaomi Redmi Y2, the selfie-centric smartphone will be available for purchase at 12 PM today exclusively on Amazon India. For the first time, Amazon has rolled out a new offer on the Redmi Y2 as the e-commerce portal is offering Rs 500 cashback to Amazon Pay, subjected if the user purchases the device between 12 PM to 1 PM on July 31 (today). The Redmi Y2 price in India starts at Rs 9,999 and goes up to Rs 12,999. Even though the Redmi Y2 features the good-old Snapdragon 625 chipset, it managed to garner some popularity due to its rear and front cameras. In our full review, we have termed the device as the best camera smartphone under Rs 10,000, and it still remains the same. As mentioned, Amazon has rolled out a new cashback offer on Redmi Y2, and it will be available only for one hour today. As part of the offer, Amazon is giving Rs 500 for the Redmi Y2 buyers between 12 PM and 1 PM today. The customer will receive the cashback in the form of Amazon Pay balance which would be added to the user’s Amazon account within three working days of the shipping date of the product. Do make a note that the purchase of the Redmi Y2 should be made using any prepaid payment method. Also, for Buyback, No Cost EMI and Bank Discount offer, Amazon states that the cashback will be issued within 20 days of shipment. The handset has a 5.99-inch HD+ display on the front, and it’s fuelled by the Qualcomm Snapdragon 625 chipset. The phone comes in two variants- one with 3GB of RAM & 32GB of internal storage and the other one with 4GB of RAM and & 64GB of internal storage. The device runs MIUI 9.5 based on Android 8.1 Oreo. It’s armed with a 3080mAh battery. The Redmi Y2’s price in India starts at Rs 9,999 for the 3GB+32GB storage option, and the premium 4GB+64GB option is available for purchase at Rs 12,999. The phone can be picked up in three colour options- Dark Grey, Gold and Rose Gold. The phone can also be purchased on Mi.com at 12 PM today. wanted to buy Redmi y2 but came to know that the MIUI rom on redmi y2 is 32 bit even though its hardware supports 64 bit and Google will drop support for 32 bit apps on the play store from August 2019 . I am thinking to buy it today. Please tell me how is the rear cameras performance (in comparision to Max pro & real me 1) as it has dual camera sensors ? It has small 3000mAh battery but is it optimised to run a full day (normal to medium usage & only hd+ display)? Any heating issues (found reviews stating “heating issues”)? I don’t like stock android + i like miui + it is light in weight. Please provide your opinion. If you’re looking to buy a good-camera smartphone under Rs 10,000, then the Redmi Y2 should be your opinion. Cameras on this device are excellent for the asking price, even the selfie snapper is the best in the business. I did not face any heating issues, buy MIUI 9.5 isn’t optimised well. However, MIUI 10 Global Beta is already out, you can flash it for excellent user experience. Battery Life is exceptional too.